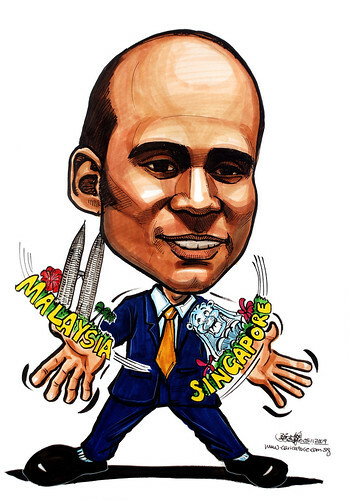 "...Can you draw him juggling Singapore & Malaysia ? Need it by this Saturday. Thanks ! " This could be one of the very low resolution and extremely underexposed photos I have received from my clients. I can't see the shape of the eyes at all, as they are under the shades. I asked for better photos, but the next photo I got was quite bad too. I highlighted to the client that I can only try my best (based on imagination from what I can see), given that I can't even see his features clearly. It will definitely affect the outcome of the caricature.